With original and classic Blues favorites-including "Sweet Home Chicago"-performed by a live on-stage band, Pullman Porter Blues is a rollicking ride back in time into the luxurious Pullman Trains, where the hidden lives of African American porters emerge to take center stage. It's June of 1937, and the Panama Limited Pullman Train is speeding from Chicago to New Orleans on the night of the Joe Louis/James Braddock world heavyweight championship. Three generations of Sykes men-African American train porters-wrestle with ghosts of the past and dreams for the future as they eagerly await word of the Brown Bomber's victory. "..."Pullman Porter Blues" is an unusual show in that it includes a lot of live music. E. Faye Butler, playing the blues singer Sister Juba, is conveniently on the train, in much the same way that Reno Sweeney is conveniently aboard the S.S. American in "Anything Goes." There's also a whole live band, which just happens to be set up in the lounge car on the huge and unnecessarily literal Goodman set by Riccardo Hernandez. This is an ambitious design that solves most of the problems created by a play set in various parts of a moving train, except the one that matters most, which is the evocation of the motion of a train, hurtling through the night. There are no original songs, which is fine. But this also is not quite a blues musical � for reasons that aren't clear, since it wants to be a musical at various junctures, only to run away at others. Better to stand up proudly for the Chicago blues and take out some of the air that floats around Smith's nonetheless entertaining production, which is a good 15 minutes too long." "...'Pullman Porter Blues," Cheryl L. West's play-with-music, receiving a lavish production at the Goodman Theatre, deals with a fascinating, once-iconic, but little-known subculture of African-American life. A work of grand ambition, it spins a tale of racism, labor organizing and the generational tensions between black fathers and sons. Sadly, it unfolds in the most predictable paint-by-number ways, with every character and event serving a highly constructed purpose." "...West's panoramic view of her milieu exhibits the seductive contrivance of a Grand Hotel on wheels, its running time extended by musical interludes-some performed by the redoubtable E. Faye Butler in her role as the touring warbler, but mostly the kind of spontaneous vocalizing frequently heard among lonely men whose own voices are their only comfort. Under the deft direction of Chuck Smith, a skillfully matched cast brings depth and individuality to their archetypal characters in quantities to keep us spellbound right up to our saga's triumphant conclusion and to send us home wishing for a sequel." "...The second act at least offers up a little more interaction and less exposition, though the plot that's there still gives off an artificial, educational air. The divine E. Faye Butler, in a supporting role as a blowsy blues singer who has history with Sylvester and Monroe, does her usual job of making you wish you saw more of her, and it's an undeniable pleasure to watch Derricks, the original, Tony-winning James "Thunder" Early of Dreamgirls, busting a move in the rare moment Sylvester's allowed to drop his scolding demeanor. Chuck Smith's staging is handsome enough, even if the train-bound setting and Riccardo Hernandez's scenic design keep it as 2-D as the side-scrolling video games of my youth." "...While at heart "Pullman Porter Blues" honors the hard reality of life for the black men who served on passenger trains - and the power of love to bind a family - the nostalgic aura of West's play also reconnects us with a time before metal detectors and body wands, an epoch of American mythology that has disappeared in a receding, bluesy haze of smoke." "...Happily, director Smith inspires sterling performances from the principals. They feel far fresher and sharper than the forcibly sentimental or generically penned dialogue would suggest. Indeed, Marshall works overtime to naturalize Monroe's unstoppably sententious sermonizing. For some theatergoers, the Sykes family's reconciliation will be reward enough for its sheer predictability. For more, this train (or plot) derails long before it reaches Louisiana." "...There are no paying customers on stage in Cheryl L. West�s Pullman Porter Blues. Instead they are relegated to the background and are sensed only by their sometime insensitivity and by their almost infantile needs. They ring the bell for service because they can, ask them to walk their children to sleep, and sometimes need them to wash away their own vomit. To get by, the porters (to paraphrase one character) let others look at them but never actually let themselves be seen. It is about time that a play be written about the Porters." 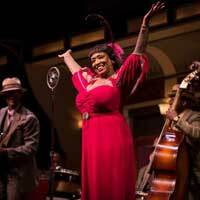 "...The union of the blues with the dramatic story produces a wonderful theatrical event. From the� evocative Pullman car set (by Riccardo Hernandez)� to the vivid video projections (by Mike Tutaj), Pullman Porter Blues captures the spirit and deep humanity of the porters. We hear (and feel) their pain through the blues and we celebrate their triumphs. Larry Marchall and E. Faye Butler lead a capable cast of actors/singers. Come take a ride on the Pullman car -it�ll be an unforgettable experience." "...This is a sterling cast of song and dance men and the lady that connets them all, Sister Juba ( E. Faye Butler in a role that was made for her and one that should garner her a Jeff nomination, for sure). The balance of the cast , headed by the always reliable Francis Guinan as the White conductor who feels the pain of the Negore�s changing world and the effect it will have on him, Claire Kander ansLutie, the poor white trash that sneaks aboard the train and is aided by Cephas and Juba ( quite the master of the harmonica as well), Senuwell L. Smith,Chic Street Man, Anderson Edwards and JMichael who is also the musical director." "...Making history come alive isn't always easy, but under Chuck Smith's expert direction it not only feels seamless, it sings. Audiences will be returning for a second viewing because this play is universal, speaking to everyone about being true to one's self and demanding dignity and respect. All of this, set to the pulsating rhythm of the rails and the smooth caress of the blues brings a forgotten era to life."